The digital organ in Ta' Pinu Shrine is one of a few very high-quality, fully-custom digital organs in the Maltese Islands. 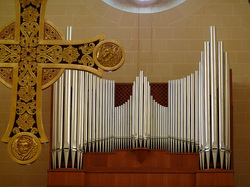 It is a Monarke organ built by the Dutch company Johannus in 2008 according from instructions from Ing Robert Buhagiar who apart from preparing the stoplist also personally selected all the digital stop samples which constitute the organ. The origins of the Shrine of Our Lady of Ta' Pinu are lost in the midst of time. The first records of its existence are in the archives of the Curia in Gozo, when the Bishop Domenico Cubelles paid a visit to the chapel. This noted that the chapel had just been rebuilt and that it belonged to the noble family of "The Gentile". When in 1575, the apostolic visitor Msgr. Pietro Duzina, delegated by Pope Gregory XII to visit the Maltese Islands, its pastoral visit to the church, found it was in a very bad state. He ordered the church to be closed and demolished and its incumbent duties to be passed to the parish church, today the Cathedral of Gozo. However, according to tradition when the workmen struck the first blow with the pick he broke his arm. This was taken as an omen that this chapel had to be preserved, and in fact this was the only chapel that survived Msgr. Duzina's decree ordering the demolition of other similar chapels on the island. In 1858 the church property changed hands and consequently its name, from "Of the Gentile" to "Ta` Pinu", that is "Of Philip". This happened since Pinu Gauci became the procurator of this church and in 1611 he willingly offered money for its restoration. It was rebuilt, a stone altar was erected investments for liturgical services were provided. He also commissioned the painting of the Assumption of Our Lady for the main altar. This altarpiece was done in 1619 by Amadeo Perugino, probably a member of the inquisitor's train. On the 22nd June 1883, Karmela Grima a forty-five year-old spinster and great devotee of the Blessed Virgin, heard a call, while passing by the chapel on her return home from the fields which surrounded the chapel. "Come, come", she heard a woman's voice say. She was confused and frightened, and began to run away from the place. The voice called again, and this time Karmela realised that the voice was coming from within the chapel, she went inside and said her usual prayers. The voice which had come from the image of the Blessed Virgin asked her to recite three Ave Maria in honour of the three days Her body remained in the tomb before Assumption to Heaven. Karmela did as the voice asked and went on her way. Shortly afterwards Karmela fell ill and remained confined to her bed for more than a year. After this time, Karmela revealed her secret to a friend, Francesco Portelli, who in turn told her that about the same time he also heard a woman's voice asking him to pray from within the chapel. Shortly after this mysterious call Francesco's mother was miraculously healed by the intercession of Our Lady of Ta` Pinu. The lonely chapel became a place of pilgrimage for many people on the island and beyond. Bishop Pietru Pace was informed about these events and after speaking to Karmela and Francesco he concluded that the voice was of heavenly origins. Devotion to Our Lady of Ta' Pinu grew rapidly, and numerous pilgrimages flocked to the chapel. Thus a decision was taken to build a worthy sanctuary to accommodate the crowds and construction of a magnificent church in Romanesque Style began in 1920. In 1932 the new Church was blessed and opened to the public and in 1935, Pope Pius XI raised it to the dignity of Minor Basilica. In the same year the miraculous image of Our Lady was crowned by Cardinal Alessio Lepicier, by decree signed by the Secretary of State Cardinal Eugene Pacelli later Pope Pius XII. In May 1990, Pope John Paul II came to Ta' Pinu Shrine and after praying in the Chapel he celebrated mass in the forecourt and decorated the image of Our Lady with five golden stars, as testimony of our people's love to the blessed Virgin Mary. While on 18 April 2010 Pope Benedict XVI, on his first visit of Malta, presented a golden roses. While addressing the crowd gathered at Floriana, before he recited the Regina Caeli Pope Benedict expressed his pleasure: "I am aware of the particular devotion of the Maltese people to the Mother of God, expressed with great fervour to Our Lady of Ta' Pinu and so I am pleased to have the opportunity to pray before her image, brought here specially from Gozo for this occasion. I am also delighted to present a Golden Rose to her, as a sign of our shared filial affection for the Mother of God. I ask you in particular to pray to her under the title Queen of the Family..."